Glennon has found her calling in life: to help others feel a little less alone. She does this by sharing of herself freely, honestly, without holding anything back. Her blog, Momastery, shows evidence after evidence of her easy way with words that drill down to what we all have in common at the core. Carry On, Warrior contains more of her trademark shameless sharing--and I mean that as a high compliment. In her words: "It's just my job to notice my emptiness and find graceful ways to live as a broken, unfilled human--and maybe to help myself and others feel a teeny bit better." While a good chunk of Carry On, Warrior, is drawn from her previous blog posts (and I was happy to see some of my favorites made the cut), there's a great deal of new material, too. And honestly, some of the book felt familiar, not necessarily because I'd read it before on the blog, but just because it rang so true with my own beliefs and personal experiences. When Will was little, maybe three years old, we went downtown to Riverfront Park. There was some kind of festival going on and they had a bouncy castle set up for the little ones. This was a cool bouncy castle; it even had a slide on it! The ramp to get up to the slide was way in the back and the door in the front was small so only little kids could get in. Will climbed into the castle, so excited to go down that slide. But when he got to the ramp in the back, he couldn't scale it. He kept sliding back to the bottom over and over again. I was watching through the mesh window, trying to be encouraging and give helpful suggestions, but the other kids kept passing by and Will just wasn't able to get to the top. Finally, another little boy a year or two older than Will stopped and grabbed his hand. He matched his pace to Will's and pulled and encouraged him all the way to the top and then let him go down the slide ahead of him. It sounds like such a small thing, but I was struck by an overwhelming rush of gratitude--I still am--when someone helps one of my children. And I think Heavenly Father and Heavenly Mother feel the same way. 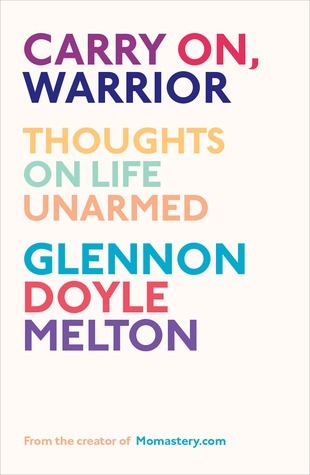 Glennon has learned the same lesson: "Maybe the simplest way to God is directly through the hearts of his children." She counsels, "Be kinder than necessary." Having recently read and reviewed Brene Brown's books on vulnerability and wholehearted living, Daring Greatly and The Gifts of Imperfection, I could see many of the principles Dr. Brown outlined put to practice in Glennon's life and writing. This, for example: "It has been said that the opposite of Love is Hate, or perhaps apathy. Yet, I'm fairly certain that the opposite of Love is Fear. I think the root of all evil is fear. Love and Fear are opposing voices, opposing ways to live, opposing platforms on which to make daily decisions, view the world, and build a life." Glennon is frank about her checkered past involving bulimia, drug use, alcoholism, and jail time. She points out: "I've never made a friend by bragging about my strengths, but I've made countless by sharing my weakness, my emptiness, and my life-as-a-wild-goose-chase-to-find-the-unfindable." While it's tempting sometimes to put on a mask of "Everything's great! ", she also reminds us that "The people who were a little rough around the edges never offended Jesus. The shiny perfect Pharisees did, though..." Being real and authentic is what allows us to make connections with others. Putting up false fronts, usually because of fear, only serves to separate us from each other. Glennon also continually bangs the drum of inclusion. With our language, with our actions, with our beliefs, we should always be trying to pull people together rather than to set up distancing us/them dichotomies. "Fancy language tends to make in people feel more in and out people feel more out, and I don't think that's how words are best used. Words are best used to describe specific feelings, ideas, and hearts as clearly as possible--to make the speaker and the listener, or the writer and the reader, feel less alone and more hopeful." And for those of us who may be hesitant to invite others into our less-than-Martha-Stewart-perfect homes, she suggests: "Maybe hostessing is not really about the host, but the guest. Maybe it's a sacred spiritual practice because every single person who crosses our doorsteps is a gift, is Jesus really. And each guest has something to teach us if we're present enough to learn. Maybe hospitality is not about my home, or my food, or my lack of stuff. Maybe it's just about soaking people in." Some of Glennon's statements of truth are aspirational. For example, she says "I am confident because I believe that I am a child of God. I am humble because I believe that everyone else is too." And then she openly shares how un-confident and un-humble she sometimes is. But she's aware and she's trying, and so am I. I believe that I am a child of God; when I'm not confident, remembering that fact helps. Self-worth, and the ability to stand up for one's self, also stems from this belief that we are children of God. "As a child of God, I have the right to speak, to feel, to think, and to believe what I believe. Those dreams in my heart, those ideas in my head, they are real and they have a divine origin, and so they are worth exploring. Just because I am a child of God. And thankfully, there is nothing I can add to the title to make it more impressive. There is also nothing I can do to lose that title." Likewise, I believe that everyone else is a child of God, too; when I'm not being humble or kind, that thought serves as a wake-up call. I love Glennon's honesty about parenthood. "There is no prize for most composed...Stop making parenthood harder by pretending it's not hard." Perhaps mothering comes naturally and easily to some; I'm not one of them. There's really not much in me of the spontaneously selfless or nurturing qualities so lauded every Mothers' Day. I find parenting to be really hard and I often feel like I'm not doing it well. So it's very comforting to hear that others find it hard, too, and feel like they're not doing it well. As Glennon says, "Life is hard - not because we are doing it wrong, just because it's hard." But the corollary to that is "God is Forever Tries." We always have the chance to simply try again to do a little better. Glennon quotes Maya Angelou saying, "I did then what I knew how to do. Now that I know better, I do better." "I think one of the keys to happiness is accepting that I am never going to be perfectly happy. Life is uncomfortable. So I might as well get busy loving the people around me. I'm going to stop trying so hard to decide whether they are the 'right people' for me and just take deep breaths and love my neighbors...I'm going to quit chasing happiness long enough to notice it smiling right at me." At the core of finding peace and happiness is choosing to live with love, because the act of loving others changes us. "We don't love people and animals because we will have them forever; we love them because loving them changes us, makes us better, healthier, kinder, realer. Loving people and animals makes us stronger in the right ways and weaker in the right ways. Even if animals and people leave, even if they die, they leave us better. So we keep loving, even though we might lose, because loving teaches us and changes us. And that's what we're here to do. God sends us here to learn how to be better lovers, and to learn how to be loved, so we'll be prepared for heaven." We'd need no glory. Heaven would be here. Glennon's certainly doing her part to create more of heaven right here, right now, and bringing thousands of people along with her.